Air hoists from the J D Neuhaus Profi range have been successfully utilised within a paint booth to facilitate the movement of material in and out of the booth. The installation has helped to boost productivity and was carried out by Engineered Lifting Systems (ELS), a major representative in the USA for the J D Neuhaus (JDN) range of high performance air operated lifting equipment. ELS are particularly proud of this upgrade, carried out for a spray booth operated by one of their customers. The customer is equally pleased with the improved performance and increased output they have achieved, as well as maintaining a high finish level for their product lines. 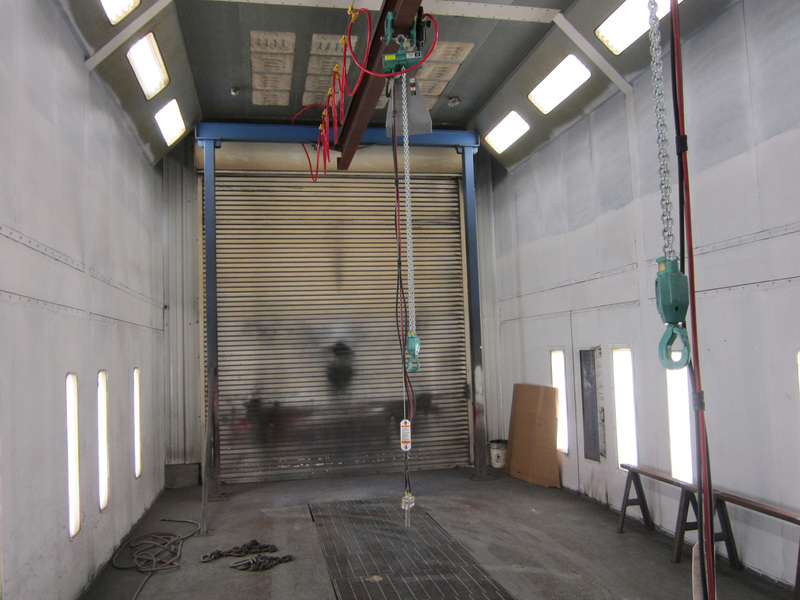 The handling of components, designated for spray booth coating operations, had previously been undertaken utilising two manually operated chain hoists located on an overhead rail running the full length of the booth. 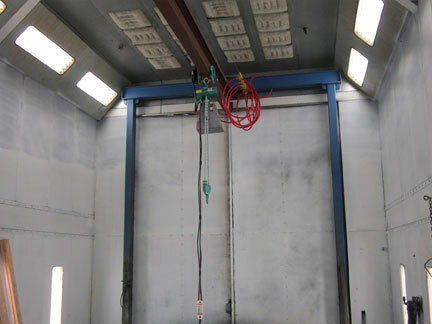 The hoists provided the necessary lift and full horizontal travel movements required for work pieces being sprayed, with all the manual actions necessary being undertaken by the spray booth personnel. With individual loads of up to 2 tonnes being catered for, it was obvious that fully mechanised load movements would improve working conditions, increase productivity and potentially enhance finish quality. ELS was both happy and confident to recommend the JDN Profi 2TI air operated hoists to their customer as the logical replacement for their existing pair of manually operated chain hoists. The choice of air operation throughout (for both lifting and load horizontal movement functions) ensured that the new hoists covered NEC ruling requirements to meet or exceed NFPA 33 standards. In fact the JDN products have a European rating EX II 2 GD IIA T4 / II 3 GD II T4 as standard, providing safe operation within hazardous or potentially explosive atmospheres as can exist in spray painting operations. Even higher safety ratings can be accommodated where increased spark protection is specified to achieve the EX II 2 GD IIC T4 safety standard. The JDN hoists operate within an air pressure range of 4 or 6 bar, and when being used at the higher pressure rating a lift capacity of 2 tonnes per hoist is available, combined with a full load lift speed of 2.7 metres/min being achieved. All lift and load traverse movements are undertaken using pendant controllers (single handed operation), with a pendant drop length provided to ensure that it can fully clear any freshly sprayed objects as well as providing a good working clearance for the spray gun operator. The hoists are suspended from trolleys running on the overhead standard beam, so providing the horizontal load movement. Each hoist is fitted with an airline filter regulator unit and a steel chain retention box, together with a muffler/oil collector to prevent spent oil mist dripping onto newly painted products. The JDN Profi TI range of hoists are very robust and include units with individual lift/load capacities from 250kg up to an impressive 100 tonnes. These hoists may be used for oblique pulling under special safety provisions. In addition, hoists can be fitted with optional trolleys which run in an overhead support beam to provide horizontal load movements. Trolleys available include manual, reel chain or motor operated versions, depending upon the degree of mechanisation required. The lift/lower and travel movements where incorporated are controlled with pendant hand controls. 3 metre lift chains and pendant control air supply leads are provided as standard, with other specific lengths available to suit user requirements. Optional operating systems are available including rope control, together with sensitive, single speed and multi function controllers, as well as both remote control and electropneumatic interface units. These JDN products are suitable for safe operation within hazardous areas and provide lube-free operation with no downtime. They are also 100% duty rated, with unlimited duty cycle capability and featuring fail-safe starting. They are also insensitive to dust and humidity as well as environmental operating temperatures ranging from ‑20°C to +70°C.